Papaya @ Porto Antico Restaurant, bar and terrace This is run by Gemma from Dublin. She now has quite a menagerie of very attractive puppies that she has rescued. 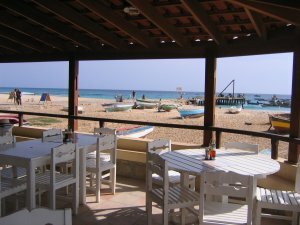 Service is very quick and friendly by Cape Verde standards. It has a balcony overlooking the sea and a poolside terrace, which you can reach by coming through the portals of the Porto Antigo complex. It features an old-fashioned pizza oven, a real brass bar rail, and a wooden floor and outside balcony. It offers English and Irish breakfasts or croissants and coffee. 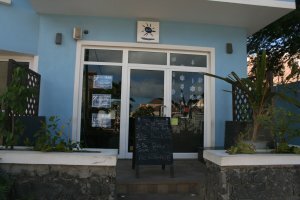 For lunch and dinner it has a wide range of meals on the menu ranging from the old Irish favourite of steak and Guinness pie through to local Cape Verdean dishes like fresh tuna steak or cahchupa and snack items like jacket potatoes and pizzas. Eventually there will also be a barbecue serving food on the area beside the pool. It is closed on Tuesdays. J from Boston found the service correct. "Papaya Restaurant, Santa Maria: The nicely designed building over the water draws us in and after seating ourselves, we are served by an unsmiling English girl who has the air of a person whom would rather be doing anything but serving us. Our café is cool and the medallion of goat cheese is no bigger than the bottom of a soup spoon. I try to engage her in conversation by asking questions and she answers with one word each time. She is neither rude nor polite. She is “correct” as a British friend of mine would put it. After we pay our bill she finally smiles when she brings us our change and hopes we “Have a nice day”. In our change dish is a 200 escudo bill and a 2 Euro coin. Obviously, she is hoping we leave her the latter for a tip but she gets neither. Pity." Has been bought by an Irish couple, Amy and Ciaran from Dublin. So go there for an Irish welcome. It serves snacks and light food . It is in one of the main streets and is very popular with English speakers. Here's Amy's own description. "My name is Amy Keenan and I recently moved to Santa Maria, Sal with my husband Ciaran.We are an Irish couple originally from Dublin. We have just bought a bar called Tam Tam which is on Rua Amilcar Cabral. We open from 8am to 12.30am Monday to Saturday serving food all day long.Although we don't want to be an Irish bar we definitely want people to feel the Irish warmth.We are a cafe-style bar offering tasty food, great service and warm Irish welcome. Tam tam is also a great meeting point for all potential investors and indeed holiday makers." Owned by Steve who worked for Pan American and Helen who is an accountant, it is below a blue painted block of flats. Despite its name it is not Italian, but the closest thing in Santa Maria to a British pub. Service is good and they run a bar tab. During Happy Hour beers are about 80p and it attracts most of the expatriate community. Later at night prices rise steeply, especially at weekends when live groups perform in the tiny room or from the open air sofas . A lot of local youths come in late at night to hear Caribbean rhythms which they prefer to Cape Verdean music. But if you miss the Jamaicans sound, this is the place to go. 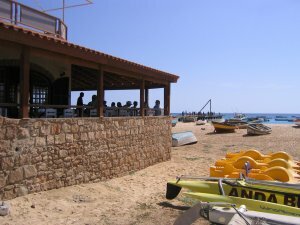 Cretcheu restaurant is on the beach near the pier. 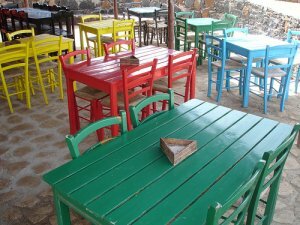 It has a fine open terrace looking out to sea and offers some good fish dishes as well as lots of pizza and pasta for its mostly Italian customers. P from London liked it. 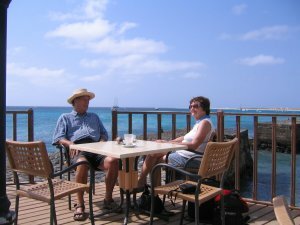 "We also loved the upstairs (open air) part of the Cretcheu"
Steer clear of the prawns here. They are imported and perhaps nopt properly maintained at frozen temperatures. People have been ill from eating them. J&T from London liked both. 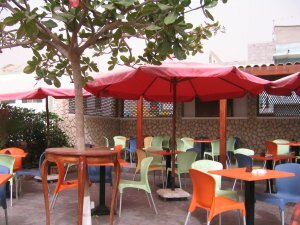 "We also found a great Italian called Leonardo's which is down a side street just past the Cafe Cultural. 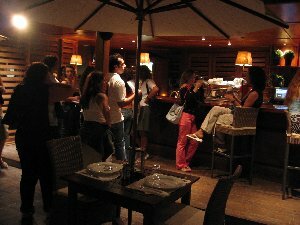 It has a fantastic atmosphere in the evenings and the food and service was excellent. 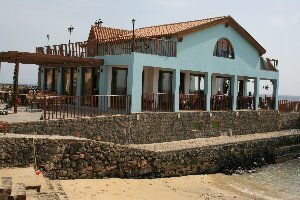 Also, we must recommend the penne arrabiatta and the pizzas at the Italian restaurant on the beach, the restaurant is called 'Cretcheu' "
"Cretcheu Restaurant: Great churrasco and friendly waiter whose eyes lit up and became animated when we told him how much we enjoyed his home island of Santo Antão. He sees me looking at the small stage and empty microphone stands and suggests that we stay around this evening for a little ‘tocatina’. When we tell him we’d like to but our flight leaves in a couple of hours. He disappears for a few minutes and returns to his station. Shortly thereafter, some cat with a mini kora (and obviously a friend of our waiter) comes to our table and serenades us with some tunes including an impromptu one about our daughter riding a turtle. She giggles uncontrollably. He finishes up, says “Boa viagem”, shakes his buddies hand and exits the restaurant." A new pizza place near the Pirata night club at the entrance to Santa Maria. D&Y from Essex were impressed. "Vasco de Gama just before The Pirate Night Club - Very nice. Music at the weekend - menu small, little more expensive but the food was good - lovely inside restaurant." M from Dorset less so. "Food good but no atmosphere on the night we went." This is part of Tom Sheehy from Clonakilty`s Cape Verde operations. It is out to the East of Santa Maria near the red Aeroflot hotel and a couple of blocks back from the sea. 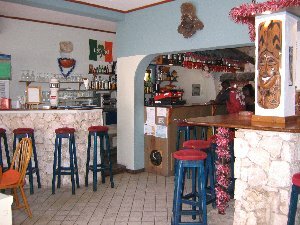 It is an Irish bar offering local and international beers and wines as well as snack food and drink at a bar or to take away. A night spot in true Manhattan style with garish interior and loud music. It is run by Brian who wanted to bring something international and loud to Santa Maria. He has done just that. Since Walther sold this to an English couple, it has decked it with huge projector screens, loud music and English beer. To be avoided unless you crave home. Bom Dia just to the right of the main street by the school is a good place for open-air snacks and good coffee. A litle smarter and with better shade just down the main street is Macronesia with Spanish snacks and at times paella. Prices here are generally much below Santa Maria and you will meet more locals. This is in Pretoria right down past the footbal stadium. 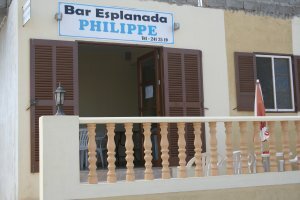 Phillipe is from britanny and as well as Ricard and Martinia they will cook you crepes and rissoles which are fresh-cooked and delicious. Prices are Cape Verdean and most of the customers are local taxi drivers. 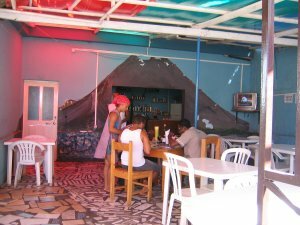 A snack bar on the way up from the salt lakes It offers a fresh water shower to remove the salt and simple Italian and Cape Verdean dishes. It isbest when not catering for bus trippers.